After the Second World War, French colonial health services, armed with a newly discovered drug, made the eradication of sleeping sickness their top priority. A single injection of Lomidine (known as Pentamidine in the United States) promised to protect against infection for six months or longer. Mass campaigns of "preventive lomidinization" were launched with immense enthusiasm across Africa. But the drug proved to be both inefficient and dangerous. Contaminated injections caused bacterial infections that progressed to gangrene, killing dozens of people. Shockingly, the French physicians who administered the shots seemed to know the drug's risk: while they obtained signed consent before giving Lomidine to French citizens, they administered it to Africans without their consent-sometimes by force. 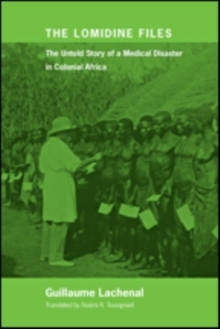 In The Lomidine Files, Guillaume Lachenal traces the medicine's trajectory from experimental trials during the Second World War, when it was introduced as a miracle cure for sleeping sickness, to its abandonment in the late 1950s, when a series of deadly incidents brought lomidinization campaigns to a grinding halt. He explores colonial doctors' dangerously hubristic obsession with an Africa freed from disease and describes the terrible reactions caused by the drug, the resulting panic of colonial authorities, and the decades-long cover-up that followed. A fascinating material history that touches on the drug's manufacture and distribution, as well as the tragedies that followed in its path, The Lomidine Files resurrects a nearly forgotten scandal. Ultimately, it illuminates public health not only as a showcase of colonial humanism and a tool of control but also as an arena of mediocrity, powerlessness, and stupidity.